This is the best chocolate cake recipe, so moist and filled with the perfect amount of chocolate! We make our chocolate cake recipe from scratch. 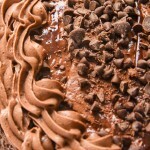 This homemade chocolate cake could also be used for cupcakes! Combine all ingredients into a stand mixer and mix for 2-3 minutes. The batter will have a runny consistency. Fill cupcakes about 2/3 full, or two 9" cake pans 2/3 full. Bake for cupcakes for 12-15 minutes, or until toothpick inserted shows minimal crumbs. Bake cakes for 30 minutes, or until toothpick inserted shows minimal crumbs.